AMS Corner Assembly Crimping Angles used to assemble metal and plastic backloaders with profile as illustrated below. The AMS #CMD-B3 Crimping Machine joins Plastic and Aluminum Backloaded Mouldings. The work station is free-standing with the joining mechanism built into a 61cm x 91cm (24” x 36”) wood composite work surface mounted on a sturdy steel frame. The 91cm (36”) high work surface is permanently tilted at a 45° angle. 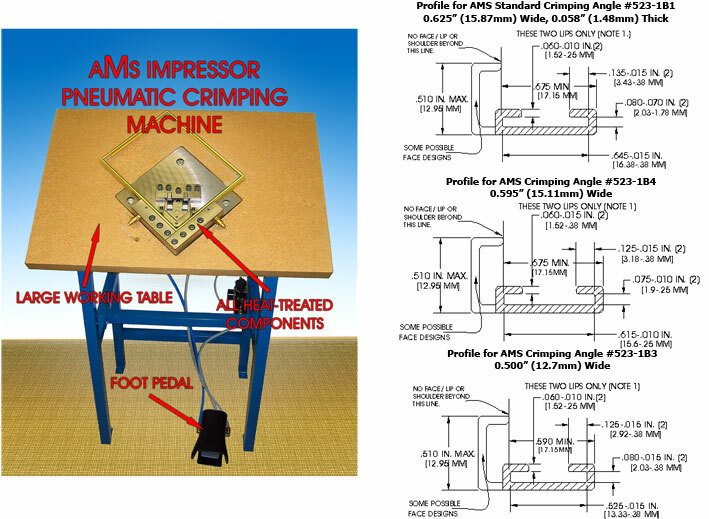 The AMS Impressor is a foot-activated pneumatic unit. It can join frames as small as 12.7cm x 12.7cm (5” x 5”). Contact AMS for information on how to produce backloading frames with 8.9cm (3.5”) sides or for mouldings requiring other width joining angles. For use with AMS corner joining (crimping) angles #523-1B1 (15.9mm / 5/8” wide), #523-1B4 (15.1mm / 0.595” wide) and #523-1B3 (12.7mm / 1/2” wide) -- see specifications in drawings below. AMS Corner Assembly Barbed Angles for #523 Backload Aluminum Profiles - Manually forced into #523 extrusion; high barbs.